Do you find yourself constantly posting photos of your meal on Instagram? 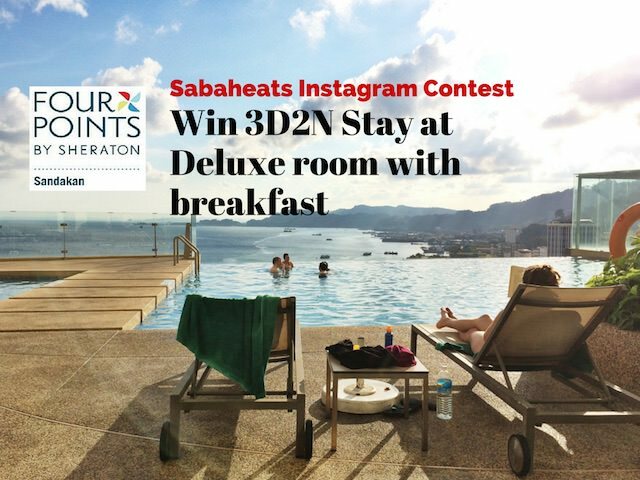 Sabaheats is giving away a 3D2N stay in Four Points by Sheraton Sandakan, Sabah to one lucky Instagram user! 1. Follow @sabaheats on Instagram. And that’s all. you can take a photos of any foods you like, from hawker food to hotel foods its all up to you (but please, no selfies). Submissions period is from 15th December till 15th January 2015. 3D2N stay in Four Points by Sheraton Sandakan with breakfast worth RM1136.80. The luxurious Four Points by Sheraton Sandakan is Sandakan’s preferred accommodation and hotel. It is the only international 4-star hotel with an Executive Lounge. 3. All entries must be made personally. a. Use of defamatory or malicious content. b. Any indecent or inappropriate content. a. They have personally taken the images submitted. b. They are the sole owner and copyright holder of the images. 6. Sabaheats has the right to use the winning images from the date of entry to 18 months after the closing date of the Competition. Sabaheats will use the images to further promote the competition/future competitions. However, all such uses will credit the photographer, provided they give their agreement. For the avoidance of doubt, copyright shall remain with the entrant. 7. Sabaheats has the right to use other entered images from the date of entry to 18 months after the closing date of the Competition for no consideration. However, all such uses will credit the photographer provided they give their agreement. (As with winning images, copyright shall remain with the entrant). 8. Each entrant’s approved image will be shown on Sabaheats’s website and social media platforms together with the image description. Sabaheats reserves the right to amend this description for reasons of presentation.